Protect your home or commercial structure with a quality made metal roofing system. Available in an assortment of colors and styles, we offer metal roofing supplies – panels and shingles – to meet just about every architectural design. More importantly, this roofing material is strong, hardy and durable and can withstand inclement weather that often hits the Oklahoma region. This includes thunderstorms and tornadoes as these roofs can handle winds of as much as 120 mph. Your order will be shipped directly to the job site for convenience. 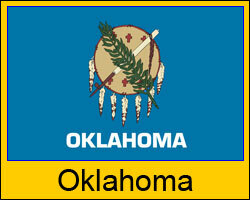 We service all of Oklahoma including the cities of Tulsa, Lawton and Enid. Begin by discussing your roofing project with a qualified customer service representative. Listed prices are valid for any area within the state although some shipping restrictions do apply. Click here for details on shipping to your job site. Looking for metal roofing in Oklahoma? Longevity although most come with a 30 to 50 year manufacturer’s warranty. Environmentally friendly and energy efficient. Able to reduce cooling and heating costs in this region of the country, many of our products further qualify for the Energy Star tax credit. A product to meet most budgets along with a variety of application processes.